They say seeing is believing. 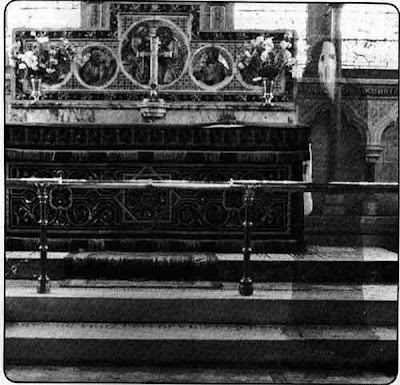 And while in this day of digital image manipulation that might not be as true as it once was, these photographs are considered by many to be the real deal - photographic evidence of ghosts. Interesting side note: In 1935, Sir Victor Goddard, now a Wing Commander, had another brush with the unexplained. While on a flight from Edinburgh, Scotland to his home base in Andover, England, he encountered a strange storm that seemed to transport him through time into the future. You can read more about his experience in the article "Time Travelers" under the section "Flight Into the Future." 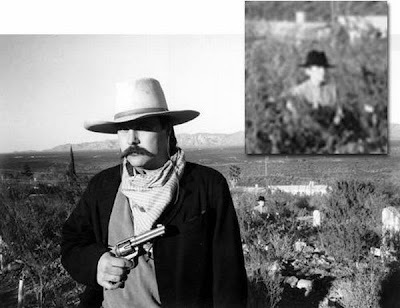 "I know there was no other person in this photograph when I shot it," Clanton insists. And he believes the small figure in the background is holding a knife. "We thought this was a tie at first, but after further review, it appears to be a knife," Clanton says. "The knife is in a vertical position; the tip is located just below the figure's right collar. If you're not convinced that something is weird here, look at my friend's shadow in the photo. It appears to be going back slightly to the right of him. The figure in the back should have the same shadow, but it doesn't!" 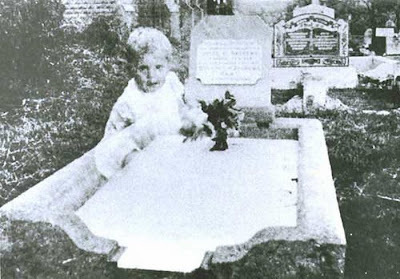 O'Rahilly submitted the photo to the Association for the Scientific Study of Anomalous Phenomena which, in turn, presented it for analysis to Dr. Vernon Harrison, a photographic expert and former president of the Royal Photographic Society. Harrison carefully examined both the print and the original negative, and concluded that it was genuine. "The negative is a straightforward piece of black-and-white work and shows no sign of having been tampered with," Harrison said. But who is the little girl? 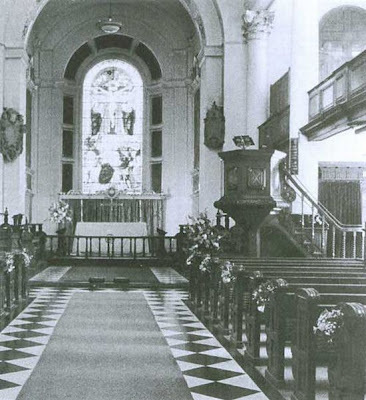 Wem, a quiet market town in northern Shropshire, had been ravaged by fire in the past. In 1677, historical records note, a fire destroyed many of the town's old timber houses. A young girl named Jane Churm, the legends say, accidentally set fire to a thatched roof with a candle. 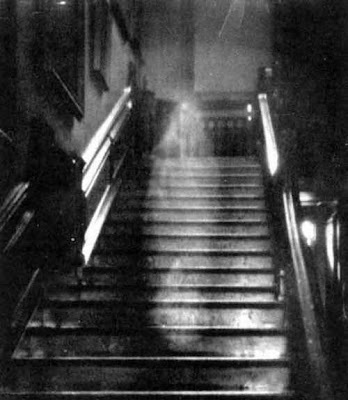 Many believed her ghost haunted the area and had been seen on a few other occasions. This video, in two parts, looks at some of the other sightings of appartitions in the building, but questions the authenticity of the photo. (Unfortunately, they examined a print of the photo and not the original negative.) See it here: Part 1 ... Part 2. 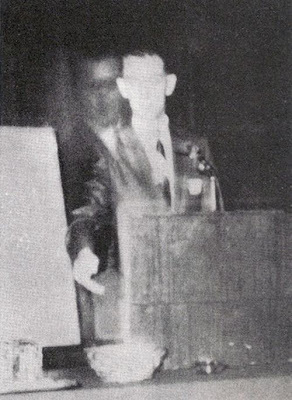 On arrival in New Orleans, the ship's captain, Keith Tracy, reported the strange events to his employers, the Cities Service Company, who suggested he try to photograph the eerie faces. Captain Tracy purchased a camera for the continuing voyage. When the faces again appeared in the water, Captain Tracy took six photos, then locked the camera and film in the ship's safe. When the film was processed by a commercial developer in New York, five of the exposures showed nothing but sea foam. 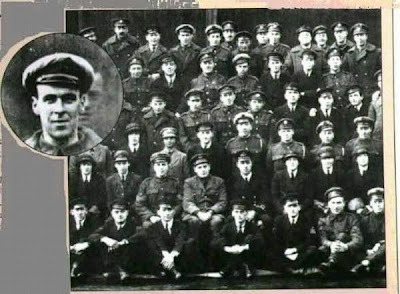 But the sixth showed the ghostly faces of the doomed seamen. The negative was checked for fakery by the Burns Detective Agency. After the ship's crew had been changed, there were no more reports of sightings. 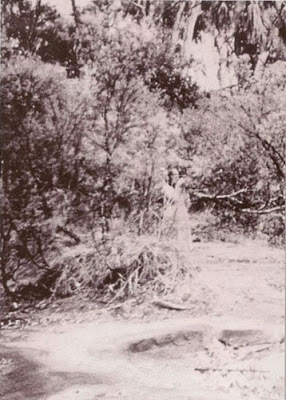 Other readers who have viewed the photo think it shows a little girl with a dog sitting at her feet. What do you think? 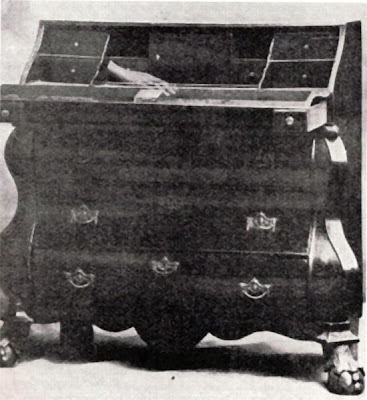 The most amazing part of the story of this photograph is that she subsequently did some research about Hawthorne and the house. While looking through a library, she came across one of Hawthorne's books, Twenty Days with Julian & Little Bunny by Papa. On the cover of that book is a portrait of Hawthorne's five-year-old son, Julian. 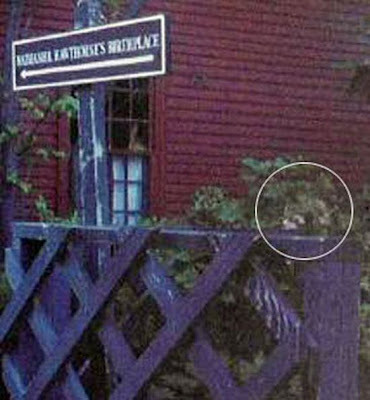 And as you'll see by clicking on the photo at left, the portrait of little Julian bears a striking resemblance to the ghost in Lisa's photograph. The film was later developed, and it wasn't until one of party members was viewing the photos that it was noticed that the first (non-flash) photo showed a somewhat blurry extra head! (In the sequence above, the second (flash) photo is actually shown first for the sake of comparison.) 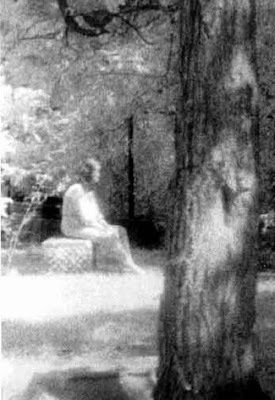 No one recognized the ghostly woman, and they could not imagine how her image appeared in the picture. 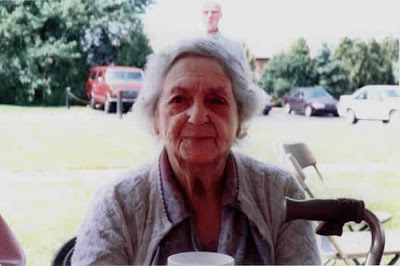 Besides being a bit out of focus, the woman's head is also too large compared to the other vacationers, unless she is sitting closer to the camera, which would put her in the middle of the table. •Mysterious whistling was heard from the kitchen several times. UPER's investigation found that the restaurant might have been built upon a very old pauper's field -- a cemetery for the poor. 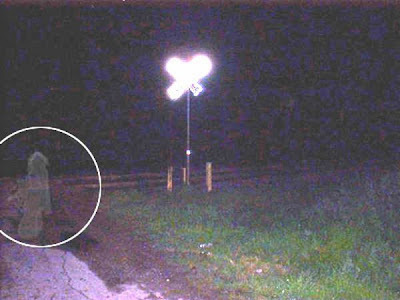 It also resulted in this photo, taken by Merry Barrentine, UPER's general manager, in 2000. This misty apparition was actually seen with the naked eye for a few seconds as it materialized in the middle of the room. 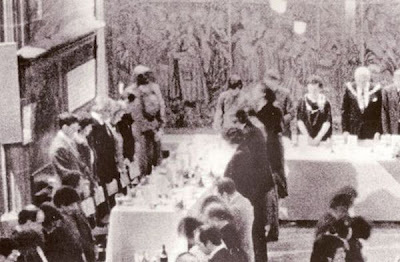 On January 22, 1985, the Coventry Freeman organization were having a dinner event at St. Mary's Guildhall in Coventry, U.K. Everyone in the group had her or his head bowed in prayer when this photo was taken -- including a towering, mysterious figure standing top left. The strange cowled spectre appears to be wearing clothing much like a monk's frock from another time. Lord Mayor Walter Brandish, who was present at the dinner, said there was no one at the event who was dressed like that, and he could not explain the presence of the interloper in the photo. This photo was taken at Corroboree Rock at Alice Springs, Northern Territory, Australia in 1959. 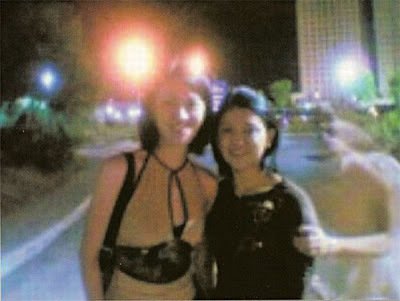 What does not seem to be a trick of light and shadow is a human form, semi-transparent, wearing what looks like a long white dress or gown. More curious, the figure seems to be holding something in the manner that a person holds a camera or binoculars. 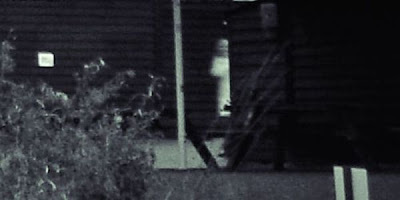 If it is not a double exposure and this is a spirit captured on film, then a number of questions arise: What is the entity looking and why? Do they have cameras and binoculars in the afterlife? Or is this an instance of a time slip in which the camera has recorded a scene from a different time? Mrs. Sayer and some friends were visiting the Fleet Air Arm Station at Yelverton, Somerset, England in 1987 when this photo was taken. 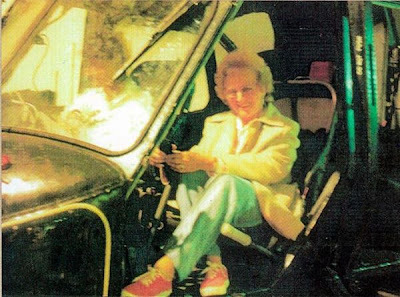 They thought it would be cute to take a picture of her sitting in the seat of retired helicopter. No one, Mrs. Sayer insists, was sitting next to her in the pilot's seat... although a figure in a white shirt can clearly be seen sitting there. 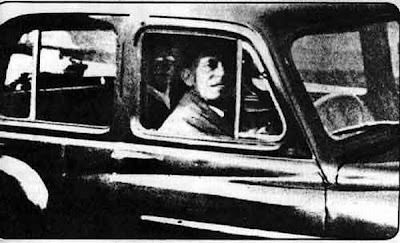 She told an investigator with the Society for Psychical Research that she remembered feeling rather cold sitting in that seat, even though it was a hot day. Other pictures taken at the same time did not come out. 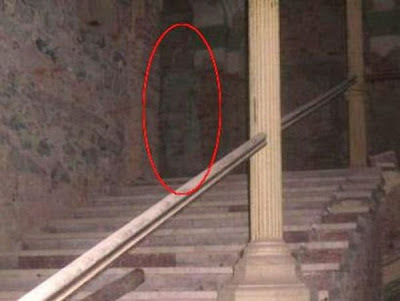 It was an image hailed as compelling evidence for the existence of ghosts. 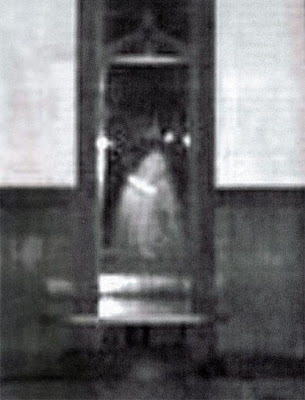 As a town hall was being destroyed by fire, an apparition of a little girl - standing behind a rail and surrounded by flames - was apparently captured on camera. 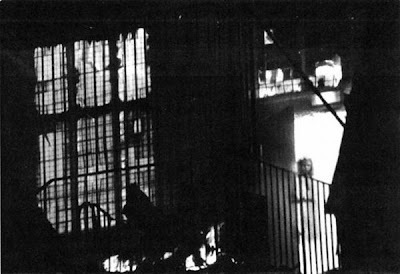 The picture was taken by Tony O'Rahilly, a sewage farm worker and keen photographer, as he stood across the road among a crowd watching the 90-year-old building in Wem, Shropshire, burn down in November 1995. The legend of the Wem Ghost was born. But 15 years on, a pensioner has come forward to cast doubt on the spectre. Brian Lear, 77, said the 'ghost' bears a distinct likeness to a girl standing in a doorway in a photo of Wem's high street. This was used on a postcard dating from 1922. Mr Lear, a retired engineer from Shrewsbury, spotted the image when it was reproduced last week as part of a nostalgia item in a local paper. 'I was intrigued to find that she bore a striking likeness to the little girl featured as the Wem Ghost,' he said. 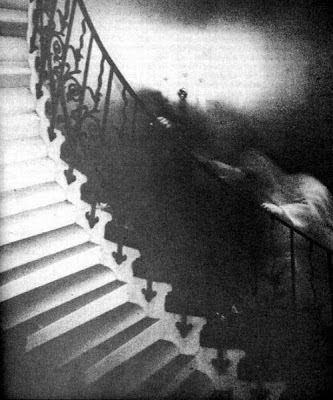 In 1995 the 'ghost' image created international headlines. There was local speculation that the girl was 14-year-old Jane Churm, who accidentally started a disastrous fire in Wem in 1677. The cause of the 1995 fire remains a mystery. Mr O'Rahilly died of a heart attack in 2005. Local councillor Peggy Carson, who knew him, said she believed the stress caused by interest in his picture contributed to his death. 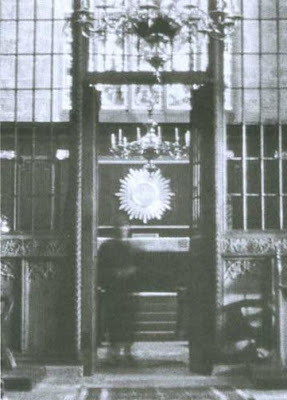 Photographic experts have suggested that the 'ghost' image was a trick of the light caused by the fire. However, Greg Hobson, the curator of photographs at the National Media Museum in Bradford, said: 'The postcard offers pretty conclusive proof that this is a hoax. 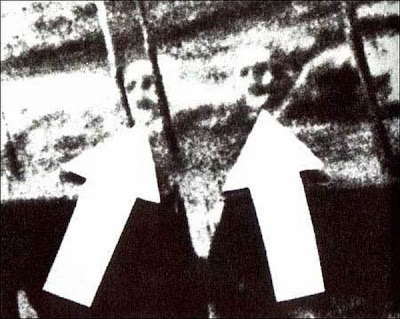 Mr Hobson said the technique used to produce the doctored photograph was probably similar to one used by Edwardian era mediums who purported to capture images of spirits with their relatives during the relatives' consultations as a way of boosting their credibility. The mediums would first ask for a photograph of the deceased person, then take a picture of it in the back room. When the client returned later for a consultation, the image would already be partly exposed on to a glass plate. 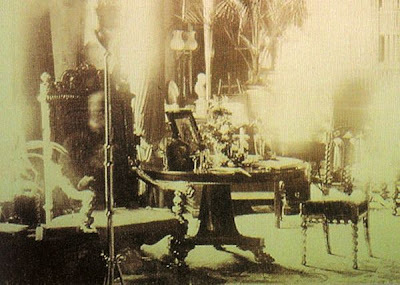 Another picture would be taken of the client during the session and exposed on to the same plate, giving an image apparently showing the spirit of their relative visiting them during the seance.